A reader asks how old a man would have had to be to join the Army for WWI. Sec. 1116. Recruits enlisting in the Army must be effective and able-bodied men, and between the ages of sixteen and thirty-five years, at the time of their enlistment. This limitation as to age shall not apply to soldiers re-enlisting. Sec. 1117. No person under the age of twenty-one years shall be enlisted or mustered into the military service of the United States without the written consent of his partents or guardians: Provided, That such minor has such parents or guardians entitled to his custody and control. The year before the U.S. entered World War I, Congress passed the National Defense Act10, which lowered the age to join without parental consent to 18. Leave it to Congress to make a simple situation complicated, but chances are, Kelly, if your ancestor joined the Army around World War I, then unless he lied about his age, he was certainly over age 16, likely over age 18 and not yet age 35 when he enlisted. Last year, in doing research for a client here in Canada, we found that her grandfather had clearly lied about his age on his Attestation papers, most likely so he would be old enough to enlist. For some reason, he also used a different year and date for several other legal papers. So by the end of the research, there were 5 – count’em, 5! – different dates and years for his birthdate. Thanks Judy for all these details about USA enlistment statutes for enlisting in WW1. Five birthdates! Yikes!!! And yes, lying about your age to be able to enlist is pretty common. As a matter of fact, the last living US veteran of WWI, Frank Buckles of West Virginia, who died last year at the age of 110, was just 16 when he enlisted in the Army in 1917! Thank you so much for your detailed answer!! My Irish great-grandfather Coleman was born in 1893, however for some reason his WWI Draft Registration Card had 1895 as a birth date. He then used 1893 (but not his real birth date)on his Social Security Application. His death record says 1894. He enlisted in the Army at Fort Devens in Massachusetts in 1917, was released in 1918 and was naturalized at the time of discharge. I’m not sure the reason for all the birth date changes. Everyone of his twelve siblings used their correct birth dates on all of their records. His brother, Michael, was even declined naturalization his first go round as he claimed “Alienship” at the time of WWI which was legal, but he was declined citizenship because of it. He had to wait five more years before he was finally naturalized. Sure doesn’t sound like he had any reason to lie deliberately on his draft registration form — even using 1895, he’d have been of age. That definitely poses a mystery, especially when all his siblings used the right birthdates! According to my grandmother, her father Coleman was a “true whiskey drinking, cigar smoking Irishman” which continued during prohibition. Even though their house was raided several times no whiskey was ever found. One day while helping her mother cook, she turned on the oven and her mother quickly went over and turned it off without any explanation. When her mother left the kitchen she looked in the oven and found her father’s hiding place – the oven! This story obviously has nothing to do with the birth date mystery, however I always loved hearing this and many other colorful stories about my great-grandfather. I absolutely adore stories like that. They’re what make doing family history worthwhile! I am trying to figure out why my immigrant ancestor lied about his birthplace, not just on ww1 draft card but on ww2 and at his college–I have record of him arriving in 1886 as a 6 yr old from Poland but he pretends to be from ohio 3x! the census’ are all over the board, Poland, ohio, Illinois–was there a stigma attached to being an immigrant and serving? There certainly was a stigma to being an immigrant, not particularly with respect to military service, but with respect to job opportunities and the usual kind of anti-immigrant prejudice. The laws were also modified by military regulations. I believe that in the Civil War the army regulations had a minimum age of 21, or 18 with permission of parents or guardians, and either 12 (or maybe no minimum age) for musicians (drummers, fifers, buglers, trumpeters, etc.) The act of 4 July 1864, 13 Stat. 379 at §5. made the minimum age 16 for musicians only, leaving it 21 (18) for all other soldiers. It should go without saying that in the 19th century tens and hundreds of thosuands of boys enlisted below the legal and regulation minimum ages – often amazingly far below. I know that at least some Canadian soldiers were allowed to enlist for the Great War in their 50s. Did the National Service Act raise the age of enlistment for the US as well? Not that I can see. The act allowed reservists to stay in the reserves but doesn’t appear to have raised the enlistment age for regular forces. 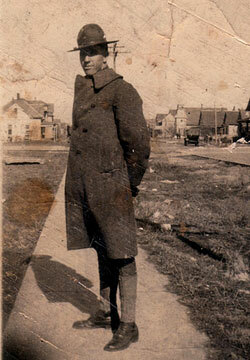 My grandfather was just shy of 16 (by 2 months) when he enlisted in the Navy during WW1. He was sent to France as a 16 year old. He lied about his age and, thus, his military headstone has his incorrect birth year engraved. I have a 17-year old ancestor who lied and said he was 18, witnessed by his father, in 1891, when he enlisted in the army. I wonder if despite the legal limit of 16, the army required 18 when they didn’t have recruiting problems. There may have been particular assignments that were only open to 18-year-olds too. I don’t think so. 18 was the general enlistment age. Just lost what I posted, so I’ll try again. I don’t think underage enlistments, while certainly not unknown, were as common as we might suppose. Having said that, it was harder to check up on a person’s age then as opposed to now. While people tended to live at home until married then, quite commonly, people being on their own as teens wasn’t uncommon either, and many people lacked proof of age. From anecdotal evidence if you made it past the initial enlistment, fellow enlistees tended to protect the underage from detection. Where underage enlistments were common was in some units of the National Guard. For example, the 115th Cavalry (Wyoming National Guard) had a lot of underage troopers in it leading up to World War Two as the Great Depression encouraged that and a teacher at the high school was directly encouraging their enlistment.